Next > Technology is Leveling the Organizational Playing Field (but not always). Good morning, Tricia – thank you for your comments. That’s a great cartoon… highly informative, but clear and easy to understand. I’ve been fascinated with that topic of late, as I’m working my way through “The Undoing Project” by Michael Lewis, the author of “Moneyball.” It is truly astounding how many errors we make because of the shortcuts we take. The ramifications of the heuristics we most often use can be profound, especially now that most of us aren’t responding to threats of wild animals or foraging for food. I wonder if we will “grow out of” this behavior or if it will simply adapt to the digital ecosystem. I unfortunately agree with your point about some individuals allowing the gaps to be filled in for them. In your video clip, we encounter the game show dilemma… and I think that’s a great example of carefully planned influence being exerted over a vulnerable individual in a position to make a very big choice. They also raise the marketing and negotiation example, which is another carefully planned and executed manipulation of these heuristics. There could be a very powerful temptation for leaders to take advantage of such tactics. I hope that we can continue promoting the positive sides of collective knowledge and learning rather than exposing the nefarious. Definitely jargon, but not sure of the price! I might toss in a word developed by one of my old colleagues, Bill Pelz – Technoheutagogy: The science and art of creating technology-enhanced learner-directed learning environments. In both your cases, people are making decisions based on disparate information. Bill points to how online, self-directed learners can enhance their learning through technology. I see similar threads in leaders weaving disparate “knowledge” together in a wirearchy-type environment. Thanks for sharing this resource, Dr. Watwood! I’m excited to learn more about technoheutagogy. Here’s the link for others who might be interested as well: http://www.technoheutagogy.com/. Dealing with disparate information, I think, is the key to leading in the digital space. Pulling together those suites of tools, knowledge management, and developing social business processes will open up those connections and allow for better learning. Fantastic post, and an award-winning title! I spent some time browsing the Tversky and Kahneman (1974) article, and appreciated their excellent explanation of mental shortcuts. The authors pointed out that most people cannot do math in their heads, especially probability. Unfortunately, even with readily available tools, only 1% of US bachelor’s degrees conferred are in math (https://nces.ed.gov/programs/digest/d15/tables/dt15_322.10.asp?current=yes). Math skills are becoming essential to a world of big data, statistics, and data visualization, to mention a few. Topping U.S. News & World Report’s list of best STEM jobs for 2017 is statistician, with mathematician close behind at number four (http://money.usnews.com/careers/best-jobs/rankings/best-stem-jobs). Glassdoor’s discussion of work trends for 2017 highlights the growing competition for workers with quantitative skills, and data scientist holds Glassdoor’s number one “best job” spot (https://www.glassdoor.com/research/studies/jobs-trends-2017/). My department is creating a mathematics degree, and I have my fingers crossed that there will be sufficient enrollments to support the program. My hope is that interest math knowledge will grow as the new digital heuristic model continues to be…well, digital. CatOnKB – this is really eye-opening information! I very much agree with you about the importance of developing math interest, enthusiasm, and proficiency. I hope that your department’s project goes well and that you can build a good program! I think there’s a lot to be said and done about the area of logic and creative thinking in math and science. How has that played into the design of the math program you’re working on? Something that jumps out to me about Tversky & Kahneman’s work is how much we don’t even know that we’re supposed to be thinking about… that even if the math makes sense, we’re still missing a whole chunk of the information or the background of the situation. I don’t think I’m being very clear on this, but I guess I’m trying to suggest that we need to be able to assess the situation in a way and THEN apply the correct analytical tools. Asking the right questions vs. getting the right answer? Thanks for jumping in on this – it’s a slant I will continue to mull over this weekend. Schoenfeld makes a case that mathematics is an inherently social activity of engaging in a science of patterns. Unfortunately, many programs are designed with former perspective in mind. Thank you for a timely reminder that this is the perfect opportunity to create an exciting, dynamic, program that is so much more than numbers! Great post! As I read it, I kept thinking about one word over and over again… trust. As you wrote, our individual limitations to knowledge and problem solving are obvious. We are influenced by any number of factors in our own understanding of a topic or issue. The social aspect is obvious, but also our backgrounds, our education, etc. The list goes on and on. Husband’s concept of wirearchy seems to rely on the concept of trust heavily. 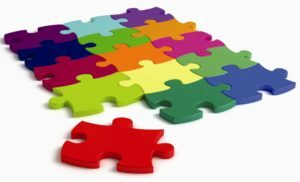 To allow the pieces of the puzzle to be filled in by others, we must let go of the idea that we can answer the question (whatever that question may be) solely by conducting our own research or relying on our education and understanding. We must recognize our biases and rely on others with different and diverse perspectives to hep solve the puzzles. The example you gave of the doctor and patient represents an area where it may be easy to rely on that outside knowledge. We recognize that our doctor is knowledgeable, educated, and experienced on the topic of our health. We can rely on that experienced individual to provide the correct information to answer our questions and fill in the puzzle pieces. However, how do we react when there is more uncertainty about the validity of the information we find or that is shared with us? If the individual or source providing that information is less known to us, what is our reaction? Do we fall back into a heuristic method of data collection and decision-making? Or, do we trust the uncertainty of gathering knowledge and information from others. I think that will be a pretty constant struggle for many, and particularly for those in leadership positions. I’d love to hear your thoughts on the issue. Thanks for the kind words… and the great questions. One thing that Turner (2012) talked about in the collective heuristic model is the notion of adjacency; the idea that we trust information because it has been filtered through a network of others who are reasonably close enough to validate it. “We thus have a considerable degree of overlapping between the areas over which a scientist can exercise a sound, critical judgment. And, of course, each scientist who is a member of a group of overlapping competences will also be a member of other groups of the same kind, so that the whole of science will be covered by chains and networks of overlapping neighbourhoods” (p. 9). To your point, this adjacency heuristic is great in a tightly controlled network like the scientific community, but becomes less so in a loose organizational (or public) network. I’m a believer in the power of the mob to facilitate the rise of the good information and the filtering out/back of the bad. That is, the power of democratic action and judgement. However, it’s also the reason that one of the most popular, democratically approved-of Reddit threads is a user’s collection of photos featuring all of the plumber’s butts he found at Comic Con. Yup. In that case, I think that Weinberger is spot on with the sentiment that the network itself is then the smartest thing in the network. BY evaluating the network we find ourselves operating in, we can determine how to proceed. Reddit is composed of a very particular subset of the internet population, and what that community finds “important” may not be representative of the larger sentiment.